Two weeks into operations of Kansas City’s new streetcar, past the pomp and curiosity of the opening weekend, people are riding. A lot of people. Initially estimated to handle around 2,700 passengers per day, Kansas City’s streetcar averaged more than 7,000 per day in its first week of operations. Scrapping plans to operate three cars most days with two on Sundays, the system has added spare vehicles to the rotation to meet surprising demand. But the surprise is not only the number of people of riding, but how they are doing it. “Why is there a stop here? Who are all these people?” As Kansas City’s new streetcar approaches the North Loop stop near 7th and Main, this is a query commonly voiced aloud to no one in particular by riders who are new to the streetcar – perhaps new to Downtown – and surprised at this pause on the journey to more lively destinations. These aren’t outrageous questions. The North Loop stop doesn’t put visitors at the doorstep of the iconic Union Station, or lively Power and Light entertainment district. There’s no Saturday City Market, or First Friday, or historic library. The setting is actually quite stark, beset on all sides by surface parking lots extending for blocks on end. As if ashamed of its surroundings, the stop at 7th and Main almost seems to hide from its passengers. It doesn’t even provide the slick shelter or canopy found at other stops to brighten things up. “I’m not ready for you yet, come back later,” it seems to say. Transit ridership is a nuanced phenomenon. Proximity to popular destinations and centers of employment, connections to other routes and modes of transportation, the comfort and ease of the route, and even the weather all mix in ways complex enough to spawn entire professions. In the case of the North Loop, the story is much simpler. Despite the stark environs and sparse accommodations, there happens to be more residents within one half mile of 7th and Main than any other streetcar stop. It’s the shortest walk for the greatest number of people who are likely to use it most. The following map looks at where people live in relation to the ten streetcar stop locations. Each dot on the map represents one resident, based on 2010 Census data. Much has changed Downtown since 2010, including the recent and pending opening of many new residential projects along the streetcar line, but the 2010 Census is the most recent data available at the level of detail of individual blocks. For this analysis, the population at the Jackson County jail is excluded, as they are obviously unable to ride the streetcar. Downtown is unique for residents because residential populations are highly concentrated, and large areas are devoted to non-residential uses. This is evident in the checkerboard pattern of population on the map. This map shows the service area for each streetcar stop. Dots (residents) within the blue lines are closest to that station. Shades of blue show 1/4, 1/2, and 1 mile walking distance. The blue shapes on the map represent one-quarter, one-half, and one mile walking distance along local streets. 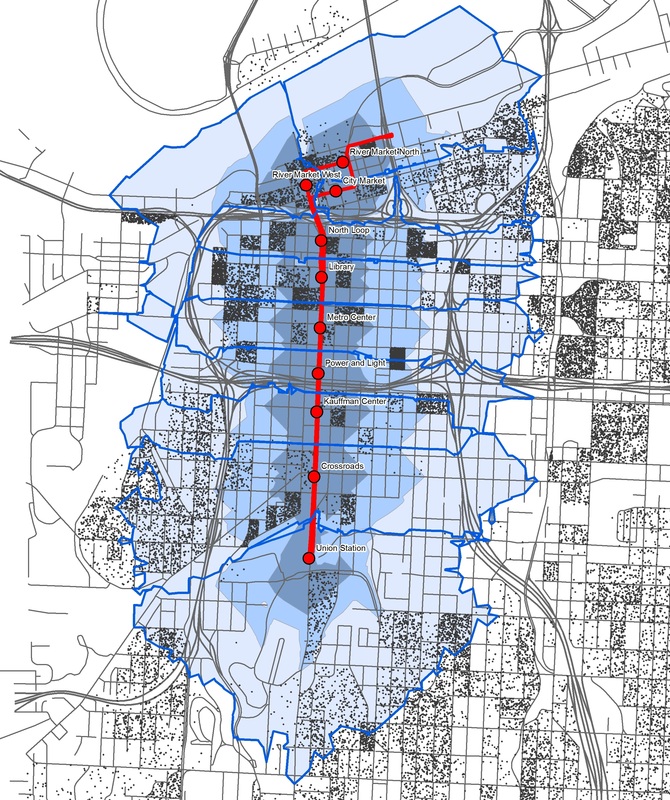 The thick blue lines show the boundaries between individual service areas for each streetcar stop. Each resident is closest in walking distance to the streetcar stop contained by the blue lines. These service area boundaries begin to explain some of the dynamics of streetcar ridership over the past two weeks. With its contiguous blocks of parking and vacant ground, and with the divisive I-70 as neighbor, the North Loop is much less dense and less active than other parts of Downtown. Employers are fewer and smaller, and there are no signature visitor destinations. However, the North Loop is the closest station for large sections of the Garment District, Quality Hill, and the residential towers at the Manhattan, Metropolitan, and the View. 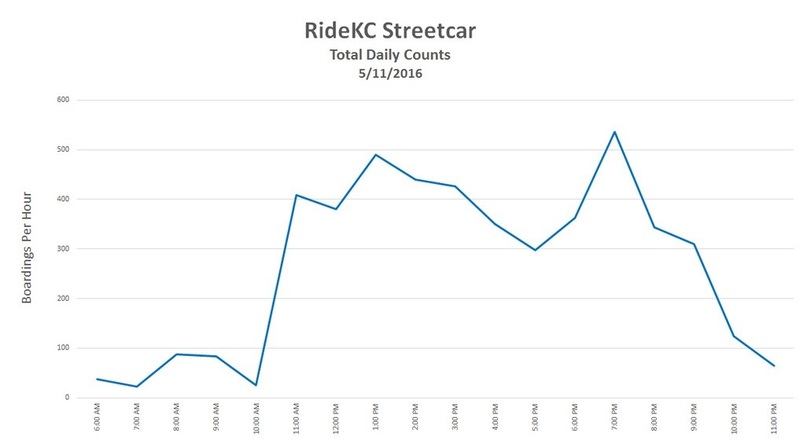 That is important, because the very early ridership data suggests that peak times for streetcar commutes are not workday commutes (ridership dips noticeably around 5:00pm), but rather lunch and evening outings. It’s reasonable to assume (but by no means definitive) that residents are playing a larger than expected role in boosting ridership. 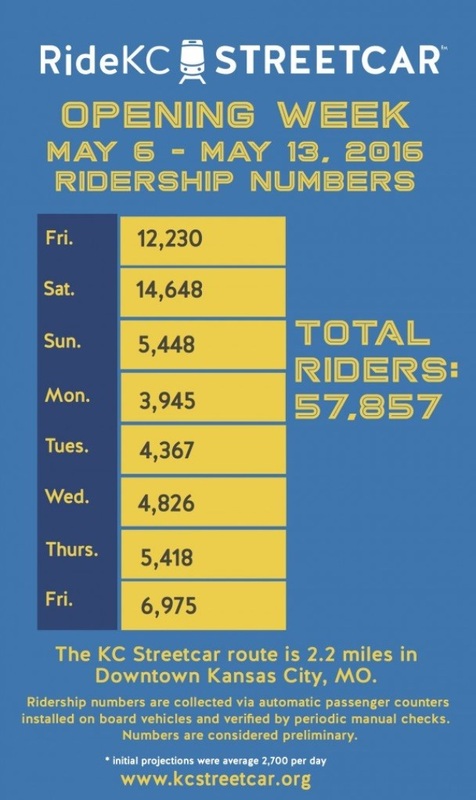 Where the mix of riders reflects an emphasis on resident trips rather than commuters, the number of riders at a particular stop will similarly reflect this pattern. Of the nearly 7,000 residents who live within one-half mile walk of the streetcar, more than 20% – roughly 1,400 total residents – will get on and off at the North Loop. 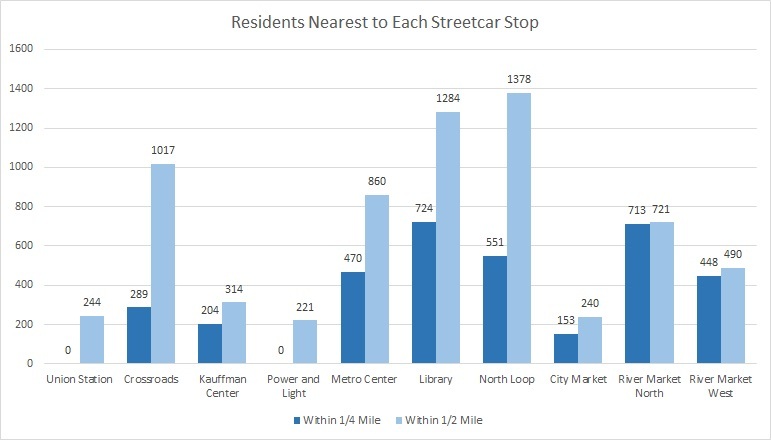 Of nearly 7,000 residents living within 1/2 mile walk of the streetcar, more than 20% get on and off at the North Loop. Of course the streetcar is already changing the dynamics of density and development along the route. 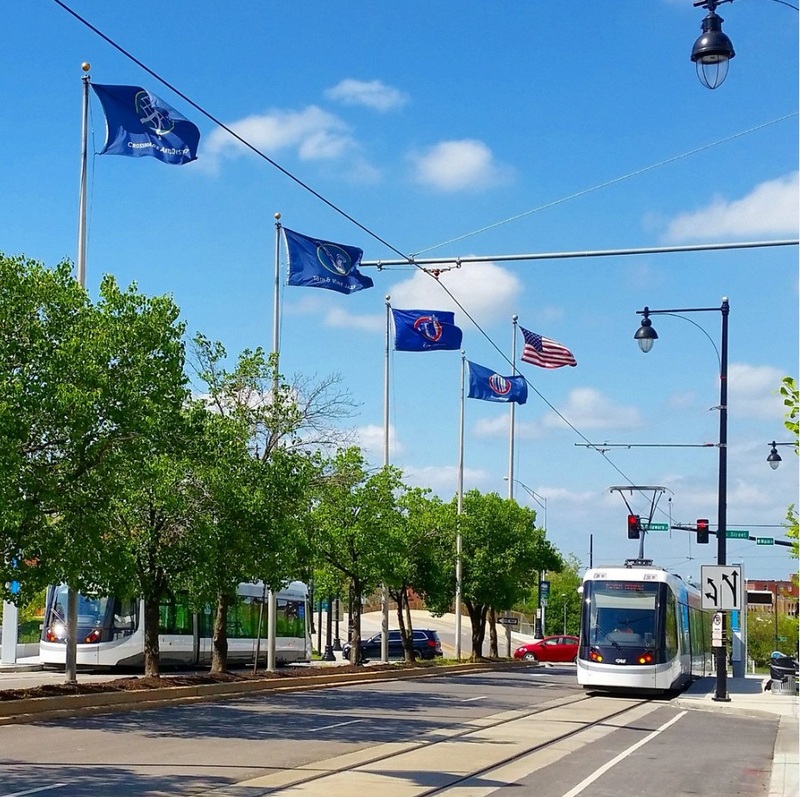 As a strategic civic investment, investment in the streetcar is intended to spur the continued growth and development. Because it is so barren today, the North Loop stop may hold more potential than any other to transform over time. In the future, with new destinations and activities on the doorstep, no one will have to wonder where the North Loop riders are coming from.